Harry Redknapp divides opinion across the country, but one thing is for sure, he guided his Spurs team in to the Champions League and along with that managed to progress in to the second phase. Yet again another quality side visits Bloomfield Road, however, Ian Holloway will be hoping that his own side will deliver another quality performance to try and upset another side that are ‘bigger and better’. Redknapp has gone on record to say that tactics don’t matter and it’s about the players (apologies for the link as it does go to the gutter aka the Sun newspaper site), but he is more of a tactician than he likes to make out. He will shift and change dependant on circumstance whether pre or in game or due to player availability. If he fails to make any consideration for Blackpool then there is a danger that his side may struggle to beat Blackpool. Dependant on the fitness of Rafael van der Vaart Spurs will either line up in a 4-4-2 or a 4-4-1-1, the latter favoured should the Dutchman be fit to start. However, even if Jermaine Defoe starts then the latter formation may still be employed as Defoe does has a tendency to drop goal side of any deeper lying midfielders. In Blackpool’s case Defoe may be asked to drop in front of David Vaughan. If so, then that will be interesting as at one point against Stoke last week Kenwyne Jones did exactly the same, putting Vaughan under pressure and lead to concession of possession. To back up some of Spurs’ formation flexibility Tom Williams did a great summary of how they’ve varied their approach in the Champions league, which shows that Redknapp can be unpredictable. However, should he go for a flat 4-4-2 he will need his players to be on top of their game to overwhelm Blackpool and in part this will go some way to backing up his claim about players counting over tactics. Arsenal have a similar four band line up and his three band system managed to over come them, by going deep and narrow. Not saying Blackpool are in the class of Arsenal here, just that theoretically, as Blackpool have seen already this season, not many teams playing a regular 4-4-2 have enjoyed much success against them. 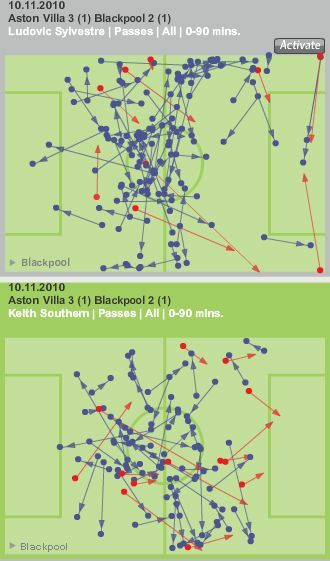 Will Blackpool once again enjoy exploiting the space between the Spurs defence and midfield and it will be interesting to see if Redknapp makes any concession to Holloway and assign a man to track Elliot Grandin. 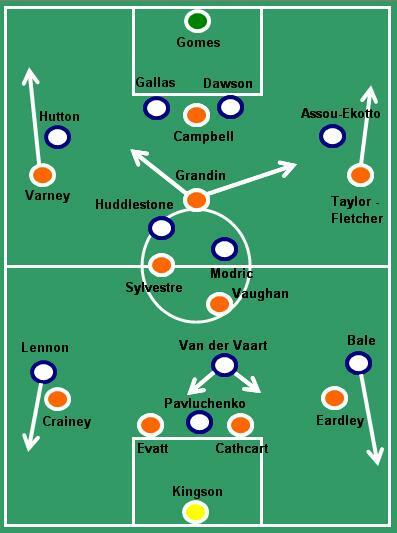 If Van der Vaart is fit then Spurs may line up like this, however, if not then Defoe may come in. Redknapp may also opt for the aerial threat of Crouch up front. Blackpool from a formation point of view are unlikely to change even in the absence of Charlie Adam. Blackpool’s key selection issue will be around, the man to replace Charlie Adam. There was a huge amount of buzz around Holloway’s team selection against Villa, however, the logic of that performance may well be justified come 5pm on Sunday. Let’s look at who could replace Adam. First up is the most obvious candidate, Ludovic Sylvestre, acknowledged by some at the club as Blackpool’s best passer of the ball. Holloway, may also choose to bring in Keith Southern as a holding option, which could free up David Vaughan to come in to Charlie’s more advanced role. The Villa game saw Sylvestre make 77 passes with a completion rate of 88% and Southern with 62 at a rate of 79%. In the tackle Sylvestre won 2 out of 2 while Southern won 1 out of 2. Southern came up with 1 interception to Sylvestre’s 2. Just based on performance based around stats then surely Sylvestre (if fit) will get the nod. However, Holloway may take a look at the positional side of this, given that the midfield three this year is staggered, Vaughan sitting deep, followed by a more advanced Charlie Adam then Elliot Grandin. In the Villa game, did anyone take up Charlie’s more advanced position? On the average position diagram Sylvestre held a more central position and as high up as Adam when he came on, whereas Southern was ever so slightly deeper. Within the pink circle you can see that Sylvestre (19) held the same position line as advanced as Adam (26) and tucked in deeper and behind Adam's marker is that of Southern. The choice could be determined with reference back to the discussion from the other week around the perfect midfield combination. In that article it was set out that in a midfield three the perfect combination would be a ball winner, a passer and an attacking creator. 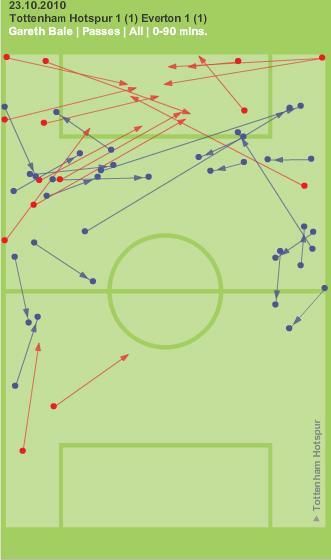 So when we look at the creativity, neither Southern or Sylvestre made any of the goals, but who made the most passes in to the opposition box. When looking at their Chalkboards you can see that Sylvestre edges that whereas Southern’s intended passes in to the box failed. So it appears that the general feeling of Sylvestre being Adam’s replacement comes out in the final analysis. Should he play then this is his real chance to cement a place in the team. However, should Holloway go with Southern he may be making a concession for the Spurs threat by using him to pick up Van der Vaart. Sylvestre also has the ability to deliver quality set pieces and scored a free kick earlier in the season in the Carling up against MK Dons. However, Holloway is unpredictable, he may also opt for Jason Euell to replace Adam, but there was little in his display against Villa that suggested he’d come in and compliment the midfield. Sylvestre managed to penetrate the Villa box, however, Southern failed. Spurs will attack down the flanks and given that they will be outnumbered in midfield this may be their best way of creating chances. Aaron Lennon is a very quick right winger who will look to get in behind Stephen Crainey. However, without doubt everyone knows that Gareth Bale poses a great threat to any team he plays against. However, he can be tamed as Everton proved earlier this season. 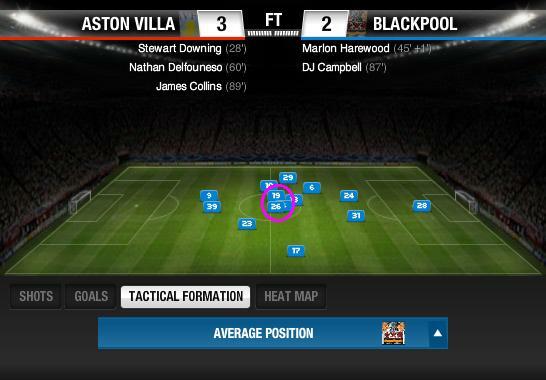 Admittedly the game came after a European night and Blackpool don’t have that factor to benefit them. You can see on the chalkboard below that Bale had a miserable game against Everton not making any of his crosses count and towards the end of the game he was moved to the right wing to escape the attention of Neville. However, Everton were canny and Bale wasn’t shackled by one man only and in fact played Seamus Coleman (a right back) in a right midfield position helped to deny Bale the space he needed. Holloway may ask Gary Taylor-Fletcher to drop slightly deeper to replicate this. Notice the accumulation of red lines as Bale struggled to connect with his team mates. Again the aerial question is posed as Spurs have Peter Crouch in their ranks and may start or be used off the bench to great effect. There is some what of a mis-truth around Crouch as some people perceive him to be weak in the air. Zonal Marking did a superb review of his aerial ability in order to break down that myth and clearly when reading it, he will need to be handled with caution should he take the field. However, Blackpool have not lost the aerial battle in their last two games and should not fear his threat if they perform to the best of their ability. Holloway will hope to make the right decision on replacing Adam, it’s something that was going to have to happen at some point this season and win or lose Holloway will have an even better understanding of his squad that can only help the team later on in the season. « Season Ticket Reward Refunds – Where Are They?